If you're in search of a casual yet incredibly stylish ensemble, consider pairing a grey herringbone coat with Tory Burch Bedford Chinos. Both of these items are totally comfy and they also look amazing together. If you're on a mission for a casual yet incredibly stylish outfit, dress in a white dress shirt and Tory Burch Bedford Chinos from farfetch.com. As well as totally comfy, these two items look wonderful paired together. 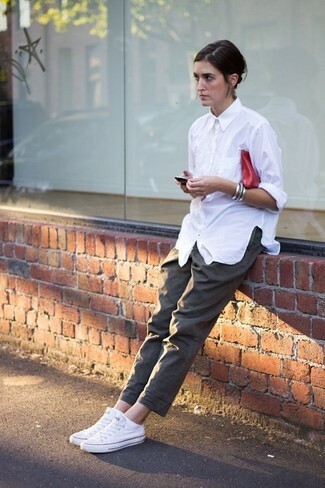 Go for a pair of white low top sneakers to make the ensemble more current.